A relatively large area of modern Pembrokeshire, lying in Manorbier and Penally parishes. During the medieval period, it lay within the Anglo-Norman manor of Manorbier (and Penally) which was a mesne lordship or honorial barony held, by the service of 5 knights, of the Lordship and Earldom of Pembroke, a heavily Anglicised region that was brought under Anglo-Norman control before 1100, re-organised along English manorial lines and never retaken by the Welsh. The barony had been held, since the very early 12th century, by the de Barris and, on their extinction in 1392, was sold to the Dukes of Exeter before reverting to the crown in 1461. From that point onwards it was leased to a succession of individuals before being settled on the Philippses of Picton Castle, with whom it remained until the 20th century. The area comprises a landscape of large, regular enclosures, quite distinct from the strip fields of Manorbier Newton character area to the west. However, the general north-south trend of the present field pattern suggests that it could have evolved from such strip fields, which may be bronze age in origin, that formerly extended into this area. By the late medieval period the area consisted of a cluster of large, substantial private farms. For instance, the important early freehold of Norchard was said to constitute half a knight’s fee in itself. There is a dubious record of Norchard in the 13th century when it was apparently a possession of Thomas Luny, but is better documented as a possession of the Marichurch family from 1452 until 1673. It was assessed for seven hearths in 1670. It was later in the Bush Estate of the Meyrick family, where it was called the ‘Demesne and Lordship’ of Norchard. The house still contains medieval elements. Similarly, the important freeholds at Tarr and Carswell were assessed in 1326 as one tenth of a knight’s fee each, held directly of the Earls of Pembroke, and each possesses a small ‘pele’ tower. Whitewell, too, appears to have been a private freehold from the late medieval period onwards, with medieval elements in the present farmhouse. However, there is little indication of their independent status in the three detailed surveys of the Manor of Manorbier, made in 1601, 1609 and 1618, although it may be significant that some of the holdings, and much of their detail, is not included. For instance, they do not mention Carswell or the substantial farm of Roberts Walls. In contrast, however, Bubbleton is recorded as a customary holding of the manor, Its ‘fields’ are mentioned – perhaps, this time, referring to open fields, possibly represented by the relict parallel, north-south boundaries around the farm. At any rate, no baronial demesne in recorded in Penally. The private status of the holdings suggests that the present fields had already been enclosed by the 17th century, supported by their morphology which suggests a late medieval or early modern date. 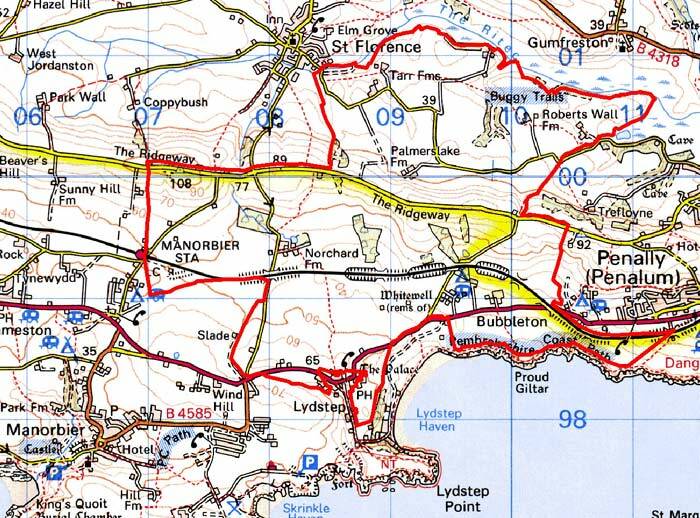 The area immediately north of Lydstep includes a field called the Langstone, identified as a possible moot-place where the freeholders of the manor met to pay their rents prior to the construction of Lydstep Palace in the late 14th century or 15th century (see Lydstep character area). The customary tenants of Penally held their court at Bubbleton. By the late 18th century, a large part of this area was in the possession of the Picton Castle Estate, including ‘The Demesne and Lordship of Norchard’. Consequently there is good historic map coverage from this period. These maps show a landscape virtually identical to that of today. The area is crossed by a railway line, which was opened by the Pembroke and Tenby Railway in 1864 and acquired by the GWR in 1896. 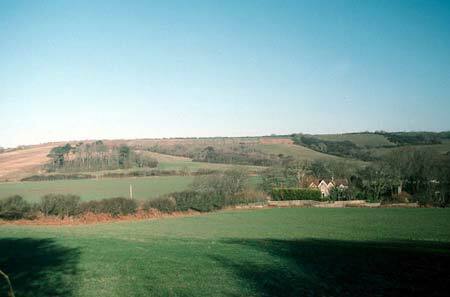 This is a relatively large historic landscape character area that runs from the south Pembrokeshire coastal plain at about 50m above sea level, over the crest of The Ridgeway to the north at over 90m and down towards the Ritec valley to about 30m above sea level. It is an agricultural landscape, characterised by relatively large dispersed farms and large, regular fields. The general north-south trend of these fields suggests that they could have evolved from the north-south aligned strip fields that strongly characterise the landscape character area to the west. 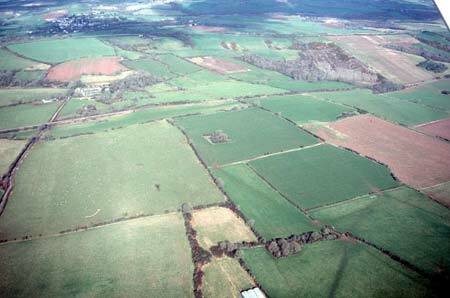 Agricultural land-use is approximately 85% improved pasture and 15% arable. There is very little rough ground. To the south of The Ridgeway Atlantic gales have reduced the higher-level, more exposed hedges to straggling lines of bushes, but at lower levels and in the more sheltered northern section hedges are thick and well maintained. Apart from small stands of scrubby deciduous trees in sheltered hollows and planting close to farms, woodland is not a strong component of this landscape. Stone-faced banks topped with hedges are the main boundary type, but occasional mortared limestone walls can be found, particularly alongside roads and tracks and close to farms. Local limestone rubble is the main building material (cement rendered and bare stone), with machine cut slate on the roofs, although a few examples of farm buildings with local stone tiles survive. Substantial houses are present, including some with late medieval elements such as Norchard, and the stone-vaulted ruins at Whitewell, Carswell and Tarr, with others in the late 18th century and 19th century Georgian tradition. Although these houses in the polite Georgian style dominate, there are examples of smaller later 19th century farmhouses with vernacular elements as well as single storey, double fronted cottages. Most of the larger farms have several ranges of stone-built, mainly mid-to-late 19th century outbuildings, some arranged around a courtyard. Several groups of traditional farm buildings have been converted to non-agricultural use. Most working farms have large, modern steel, concrete and asbestos agricultural buildings. The proximity of Tenby, particularly to the eastern side of this area, has promoted the growth of tourist facilities including campsites, caravan parks, a golf course and buggy trail. Three main east-west routeways pass through the area: The Ridgeway, the A4139 and the Tenby to Pembroke railway line. In addition to the ruined medieval houses, recorded archaeology is rich and varied and includes: prehistoric flint working floors, a bronze age round barrow, an iron age defended settlement, a corn mill and several old limestone quarries and limekilns. Although not dissimilar to some neighbouring areas, the large farmhouses, some with medieval origins, and the large, regular fields characterise this landscape. It is not, however, always possible to define its boundaries with precision, except to the west against strip fields and to the south where it borders the coast zone.